SINGAPORE - A stray python caused a stir at a wet market in Bukit Batok on Saturday morning (April 28), with a crowd of people gathering to take photos and videos of the reptile. A video posted by Facebook user Sunny Rajah shows the large snake coiled in the eaves of a roof. Several people are shown crowding around, taking videos of it and chattering excitedly. Mr Rajah later posted a photo of the crowd of about 30 to 40 people, "all waiting for the snake to come out". Mr Kalai Vanan, deputy chief executive officer of wildlife rescue group Animal Concerns Research and Education Society (Acres), told The Straits Times that the group received a call about the python on Saturday morning. "It is our native reticulated python which was sighted at a wet market," he said. "We believe the python was eating a rat when it was first sighted. 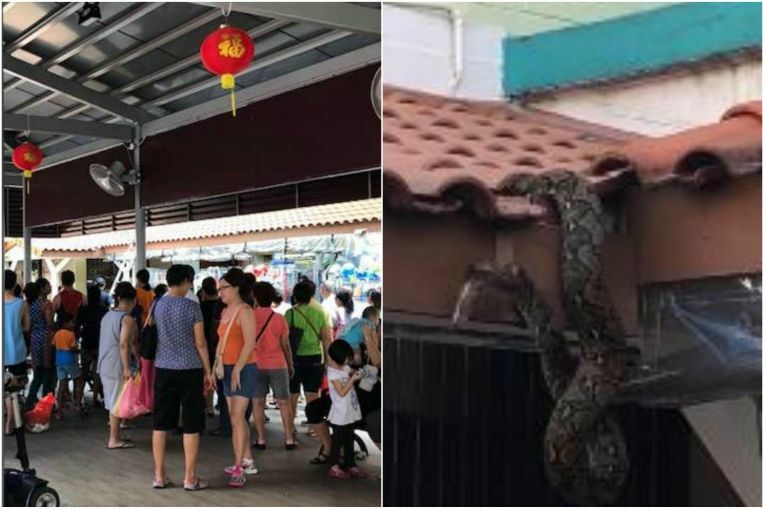 The snake had gone back into some roof gap and could not be located." He added that "there is nothing to be worried about". "Rats and small birds do tend to use roofing areas as homes and the snake probably decided to stay there to find food," he said. "Areas like wet markets do tend to attract rats and this in turn will attract pythons which are great at controlling rat populations." Acres urged the public not to be alarmed, and advised them against provoking or handling the snake. Anyone who spots the python can call Acres on 9783-7782.